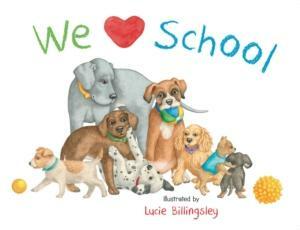 Lucie Billingsley and Hachette have together created a great first-day-of-school book to give children an insight as to what school is all about. The pupils in the story are puppies, both big and small, many varieties of the dog spectrum. Each animal example is beautifully and realistically created in stunning detail. The school day begins with the puppies finding their own basket to place their belongings, and enjoying art time and being encouraged to take a toilet break. One puppy makes a mistake before he can trot outside. Each step of the day is told in simple fashion, and Lucie has maximised the impact of her illustrations by keeping the supporting background artwork uncluttered. Plenty of white space brings the puppies forward and no doubt parents will be asked, "What kind of puppy is that?" Playtime, lunch time, walks, getting wet in the rain and having a nap is demonstrated, ending with storytime and the puppies taking their artwork home to their families. Children will easily relate to the activities and see themselves in the story. This is a delightful picture-book with its stunning colours and realistic depiction of what puppies do and how they react. It is bound to be much read leading up to a child's first day at school. I loved the “bones and balls” inside covers.